July 21, 2010 Can you hear the drumbeat, Hollywood? It’s getting louder. Girl advocates like Jessica Lawrence head to Capitol Hill to discuss H.R. 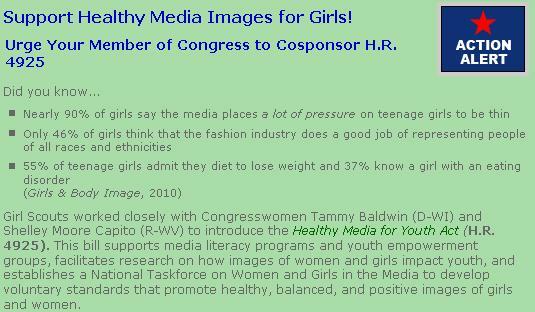 4925 tomorrow to share firsthand data about how depictions of women and girls in the media affect youth health and are landing sideways. Today we’ll hear from both of these advocates for girls in part two of our Healthy Media Youth Act coverage, asking some tough questions about whether this bipartisan legislation has sharp teeth to be actionable and chomp down on worst offenders profiting on the backsides of kids, or whether it’s more of a nibble, nosh and nudge to stop devouring childhood and raise awareness for consumer action. Already HR 4925 has drummed up some power hitter partnerships in raising awareness as you can see by hearty hoorays far beyond Shaping Youth’s extensive HR4925 coverage here. Why are we all SO eager to embrace this three-pronged bill? Because it’s a rational, common sense public health initiative that marks the start of a massive media mindshift toward accountability and responsibility for how we message, portray, and value human beings in our culture. Why is there such a need for a bill like this now more than ever? A quick look at some of my own coverage right here on Shaping Youth should give anyone who hasn’t been paying attention to the objectification of girls and women a strong bracer, as kids are literally being sold as ‘goods and services’ for the pleasure and consumption of others. Bleh. Girls are not candies, or meat, or dolls, or boy toys or props or prostitots or BabyGaGas fercripesakes. Our pop culture has devolved and debased their right to childhood in all its healthier forms. Enough! So without further ado, here are my questions to two of these mighty girl advocates challenging sexualization and media portrayals. I’d love to hear yours, so leave ‘em in the comments below and I’ll do another drawing for Packaging Girlhood: Rescuing Our Girls From Marketers Schemes written by Shaping Youth advisory board members Dr. Lyn Mikel Brown and Dr. Sharon Lamb who also served on the APA Task Force on the Early Sexualization of Girls, and are integral in the SPARK Summit coming this fall October 22, 2010 to NYC’s Hunter College where we’ll team with teens to champion change in this arena. Amy Jussel, Shaping Youth: Do you think social change can be legislated? Melissa Wardy, Pigtail Pals: I think change CAN be legislated. Content standards for both media and toys needs to be set, defined by the APA’s research on what constitutes sexualization. The gender stereotypes marketed to kids is sadly a part of our masculine based culture and are many times arbitrary, but the sexualization is prescriptive and can be controlled. It is no different than messages about smoking, alcohol, or drugs aimed at youth. This is a matter of public health and children’s rights, once again parents are left to protect their young. Amy Jussel, Shaping Youth: Is HR 4925 more awareness-raising or do you view it as actionable legislation? Melissa Wardy, Pigtail Pals: Is HR4925 Actionable? Yes. Awareness-raising? Absolutely. I think awareness-raising among parents is crucial at the 0-6 yr old preschool level. So many parents tell me they are changing the way they think after they hear Pigtail Pals’ message to Redefine Girly. To me, this is as common sense as teaching children hand washing or teeth brushing skills. It lays groundwork for a lifetime of healthy living. As parents we need to understand that children have a basic human right to grow with a sense of self-worth. We need to change our thinking so that preschoolers are ‘raised with’ NOT ‘introduced to’ the concept of media literacy and self-worth not being tied to bubblegum pink licensed characters with coy princesses and fairies on every toilet seat and diaper, or as you called it ‘womb to tomb’ marketing. We can raise a media-savvy generation of girls who at grade school or middle school ages are ready and empowered to take on actionable items. When 4-year olds are given Tinkerbell Valentines cards by teachers, it’s laying the groundwork at the early preschool stage of characters defining what girls ‘should look like’ —you can’t find girls items in our Midwestern local big box retailers that don’t carry branded, sexualized messages. Sure there are Etsy offerings or high end apparel online, but why should appropro kids’clothing/media literacy be a privilege for the rich? If we can change the parenting and products that enter the lives of our young children, the initiatives like Girl Scouts and Girls Inc that work with the older girls will be that much more about empowerment and less about deprogramming. I love the work both groups do, but my daughter is still 2 years away from being eligible to participate. I can’t wait that long! Parents need help with media literacy and fighting sexualization long before kindergarten. We need to ‘redefine’ healthy media on our own terms. Amy Jussel, Shaping Youth: What about enforceability? How would a bill like HR 4925 be regulated? Is this an FCC or FTC issue of slapping legal fines? Jessica Lawrence, CEO/Girl Scouts of San Gorgonio Council: To me the whole sexualization issue gets muddy when people chalk it up to ‘personal taste’ and get away from the scientific facts of young kids being hurt by this kind of exploitation…It’s a public health issue kind of like the tobacco marketing being shut off to targeting kids; sure there are kids that will ultimately still smoke but they don’t have the ads in their face constantly. I’d like to see the development of a list of ‘standards’ for consumer advocacy, a ‘Good Housekeeping’ seal for basic corporate community criteria so we can CHOOSE to support (or refuse to buy from) companies consistently churning out unhealthy messaging. Melissa Wardy, Pigtail Pals: I think childhood media and products should have FCC standards that when broached, are publicly shamed by press and fined in a structured way that discourages companies from trying to profit off of the exploitation of our kids. The same would happen if companies were marketing overtly racist products. Sexualization is just as harmful. When I went to Washington, I met with Amber Shipley, (legislative assistant to WI Congresswoman Tammy Baldwin who authored HR4925) whose district is literally 13 miles south of my front door and she spent about an hour and a half with me hearing the level of brainwashing that exists at VERY young preschool levels of media messaging. We talked about the need for EARLY intervention and media literacy training in preschool 0-6. If we wait until the ‘tween’ years (which is a term created by marketers in the first place) then our work is just that much more difficult. I tried to impress upon her the need to raise our girls with these messages. Amy Jussel, Shaping Youth: What kinds of alternatives in terms of policy or best practices do you view as viable to legislative mandates? Jessica Lawrence, CEO/Girl Scouts of San Gorgonio Council: Well, like we talked about earlier, the peer to peer mentoring to make sense of it all is key, with older girls helping younger ones and positive imagery promoting healthier messages…but I agree with you that boys need to be brought into the issue of sexualization as well, since they’re consuming the media and forming their views at these early stages too. I think the consumer advocacy approach to leveraging buying power is the strongest way to combat ‘nanny state’ accusations, when orgs and advocates unite and band together with a common theme. Melissa Wardy, Pigtail Pals: I’d like to see small businesses awarded grant money for product development and PR, there are many parent-owned businesses working hard to change the face of the marketplace…we just don’t have the massive marketing machines behind us. Parents need affordable options in the marketplace. We need to start thinking of these policy practices as public health issues just like putting on a seat belt or littering, or tobacco/junk food initiatives. The inclination to say, ‘that’s just the way that things are now’ doesn’t fly. Amy Jussel, Shaping Youth: What about the boys? Sexualization applies to them, too! Both Melissa & Jessica concurred: All of the above applies to boys. There isn’t a pink side or blue side to early childhood. There is just childhood. Sexualization is hurting our boys, and certainly they can and should be a part of the solution and a peer-based advocacy campaign. Shaping Youth’s Snapshot: Why HR4925 Should Apply To BOYS Too!